Why Does the U.S. Want to Seize Mosques? 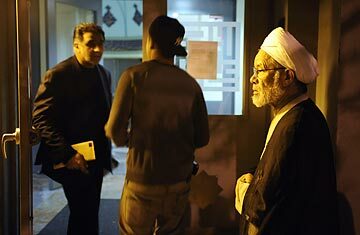 An Imam, right, enters the Razi school Thursday, Nov. 12, 2009 in the Queens borough of New York. The school was among the assets seized by the federal government in a civil complaint in federal court seeking the forfeiture of more than $500 million in assets of the Alavi Foundation and an alleged front company. Federal prosecutors Thursday took steps to seize four U.S. mosques and a Fifth Avenue skyscraper owned by a nonprofit Muslim organization long suspected of being secretly controlled by the Iranian government. Amid ever-higher tension with Iran, the Obama administration made a bold legal swipe at Tehran this week that could send shock waves through the Muslim world. In what appears to be an unprecedented move, the Department of Justice filed notice in federal court in New York on Thursday that the government intends to seize the assets of a foundation with alleged links to the Iranian government, including several mosques around the country. The department's action against the Alavi Foundation in U.S. District Court in Manhattan expands a forfeiture proceeding which began last December against the Assa Corp., a part-owner of a 36-story high-rise on Fifth Avenue. But in what may be a first, the government also seeks to seize additional properties in New York, Maryland, Texas, Virginia and California, some of which house mosques, Islamic centers and schools. The flexing of the Administration's emergency economic powers sends a clear signal to Tehran that Obama won't tolerate what Preet Bharara, U.S. attorney for the Southern District of New York, described as effectively an American front for the Government of Iran. Washington alleges that the foundation launders money back into Bank Melli, the state bank of Iran, secretly supporting Iran's illegal activities in the process. For two decades, the Alavi Foundation's affairs have been directed by various Iranian officials, including Iranian ambassadors to the United Nations, in violation of a series of American laws, Bharara said in a statement. There are also pending federal criminal charges against the foundations former president for obstruction of justice. Bharara's office later clarified that there was no allegation of wrongdoing on the part of the tenants or occupants of the properties. The foundation has denied ties to the Iranian government. An Alavi attorney did not return calls or e-mail from TIME seeking comment, but has stated that the foundation is cooperating with federal authorities and would prevail in court. Calls and e-mail to the Iranian mission at the United Nations were not returned. The action is the latest in a geopolitical tug-of-war between President Obama and Iranian President Mahmoud Ahmadinejad. How the Administration's newest signal is received may depend on the listener. The actions could hearten some Iranian dissidents, who urged President Obama to take sides during surprise counter-demonstrations to their governments celebration of the 30th anniversary of the U.S. Embassy seizure. It could also be welcomed by some Sunni Muslim nations at odds with the Shi'ite regime in Iran. But the actions  particularly the seizure of the four mosques in New York, Maryland, California and Texas  could also sour the Muslim world toward Obama. The Council on American-Islamic Relations, a Washington advocacy group for American Muslims and itself often a target of criticism from conservatives, warned that the move could constitute a chilling effect on religion, and send a very negative message not only to people of faith, particularly American Muslims, but to Muslims worldwide. "Already we're seeing around the Muslim world headlines saying the United States government seizes American mosques," he said. Ruth Wedgwood, director of the International Law and Organizations Program at the School of Advanced International Studies at Johns Hopkins University, said that she was unaware of any direct precedent of the government seizing mosques, and said the judge in the case will probably scrutinize the move closely because it involves houses of worship. While it would be impossible to have spun this up overnight in response to a thrust and parry from the Ahmadinejad regime, she said it's possible that Iran's decision to walk away from a nuclear recycling arrangement may have played a role in the timing. Regardless, she said, there will likely be negative reaction in the Muslim world. It's delicate, she said. "The President's going to have to make clear that it's not intended to be in any fashion disrespectful of the act of worship." See pictures of the rise and fall of the Shah of Iran. See pictures of the aftermath of Iran's election.